I know what is a steak house. 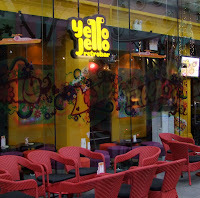 But what is Yello Jello? Looks more like another watering hole. Oh yes, it said 'retro bar'. It boasts of live bands and disco/pop music of the 1960s and 70s. It must be hot, hot and hot inside.